Last week I was at the Parking Industry Exhibition 2017 in Chicago with more than a thousand other participants. I learned a great deal from many fascinating attendees with diverse connections to the world of parking. The 26-hour journey was worth the effort. Many thanks to the friendly organizing team at Parking Today for inviting me to give two keynote talks at my first PIE! I want to use this post to simply share my presentations. My central goal was to help stiffen spines regarding on-street parking management while arguing that parking management is the foundation on which to build parking success without excess. I also introduced the basics of Adaptive Parking and offered some international flavour to entertain an audience drawn mostly from North America. My slides are below so scroll down to browse both the Monday morning keynote and then the Wednesday morning keynote. If you can't see the slideshows below (Slideshare is blocked in certain countries), then let me know. Shoupista bonus: did you spot Prof Donald Shoup and his wife in one of the photos? What do you think? Any questions or comments? I had 24 hours at the end of PIE for a look around in Chicago. This included sniffing out various parking curiosities, which I may share in another post. Many, many great points in these presentations - we're so sorry we missed this presentation in full. 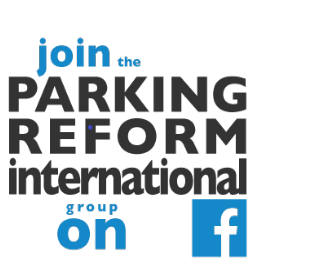 In particular with regard to the adjustment of prices, which always receives resistance, of benefit to parking managers is the idea of arguing the principle rather the price itself (e.g., we are adjusting the price to achieve the target occupancy). Once the target has general agreement, arguments against the price change (and it could be adjusted down to achieve the target) have little other than emotion to support them.